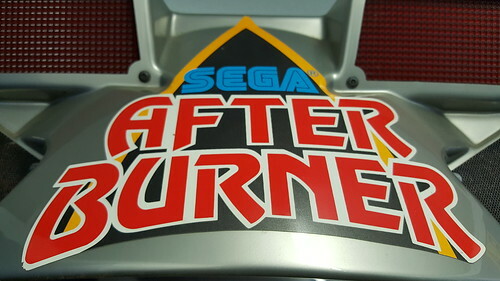 Whilst preparing After Burner for the journey to its new home, it occurred to me that I’d acquired a few arcade cabinets over the years and passed them on before featuring them on the blog. 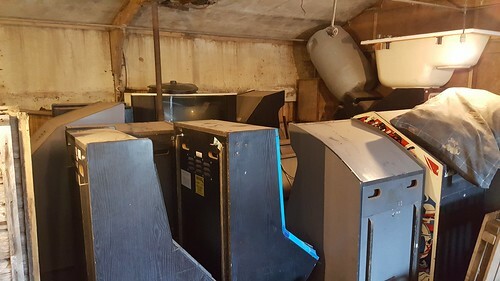 Most of these cabs were sold on to fellow arcade collectors due to space issues, the need to raise some funds for yet another ‘must have’ cab coming along, or a combination of the two! 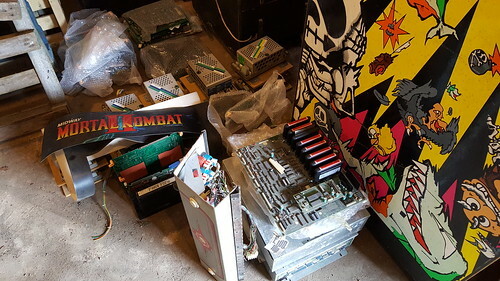 Here is a rundown of machines I’ve parted with since getting into the hobby, in roughly the order in which I sold them. 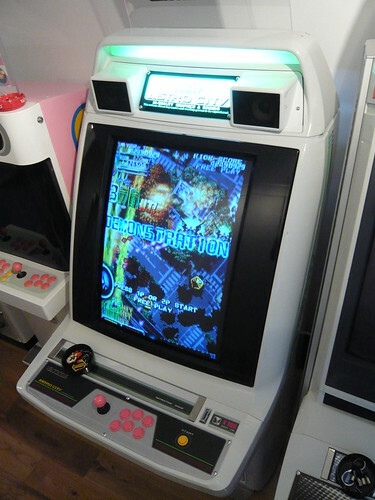 The Cyber Lead was my first arcade cab, which I picked up back in 2010. It’s Namco, purple and has an awesome LED marquee display! I didn’t do much to the cab other than cleaning and fitting a new speaker. I really like how the speakers are mounted at the side of the monitor. 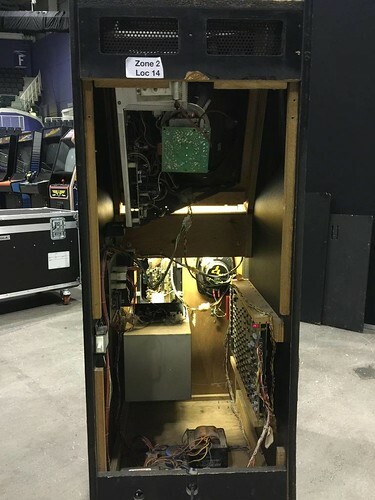 The cab also features the odd combination of JVS wiring and a 15 / 24KHz monitor. 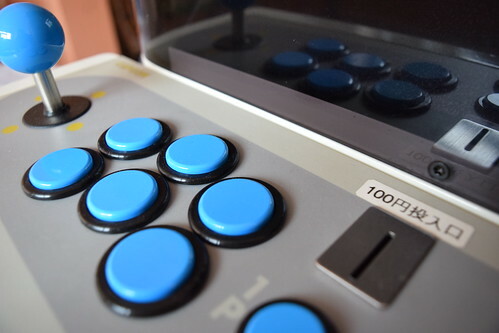 The control panel is slightly higher than the Astro / Naomi / Egret II CP, and I found it very comfortable to play on. Sadly it was also my first cab to go. I sold it mainly due to space issues and the fact that the monitor can’t be rotated. 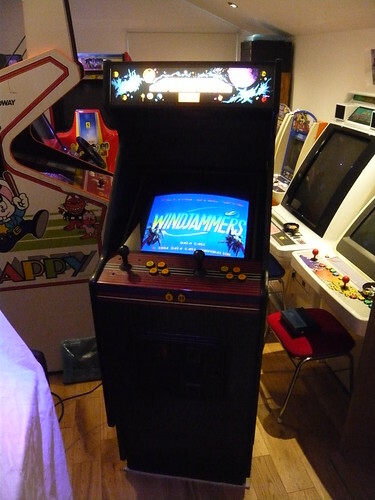 However it’s an awesome cab and one I would love to own again. 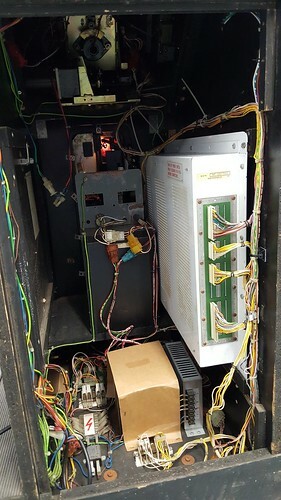 This cab had been bought by the previous owner from an Operator Raid and was missing the PSU and the Taito Type X hardware. 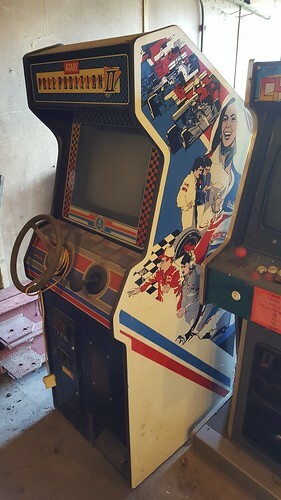 A few months later a fully working cab appeared on Ebay, and I decided to buy that one and sell this on as a project. Back in 2012 I picked up a Project Cute. The cab was very tired and needed a lot of work to bring it back to its former glory. 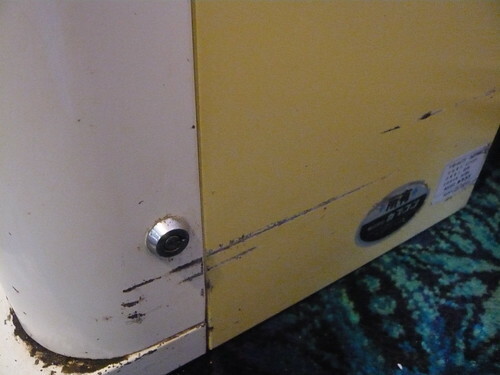 The monitor had some serious burn, a home made custom panel had been fitted, and the paint work had a lot of scratches and was in generally poor condition. 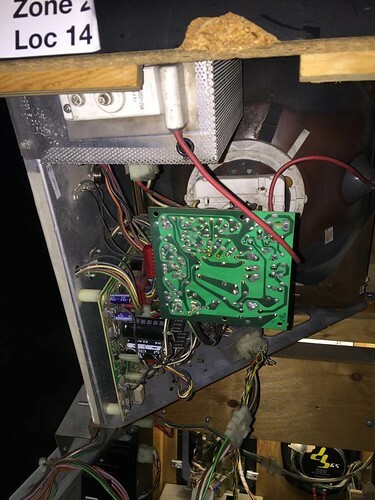 To top it off some punk had poured coffee into the control panel! 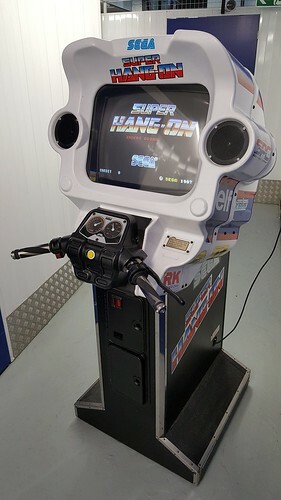 The cab was cleaned and resprayed, a new control panel, joysticks, buttons and looms were fitted, new side art and manufacturers stickers were applied, and the knackered, non-stock monitor was replaced with a NOS 17” monitor. I picked up another Yellow Cute shortly after buying this and sold the project Cute once it was complete. This has been my biggest project to date, and I was really pleased with how it turned out. These are fantastic cabs with a small footprint. 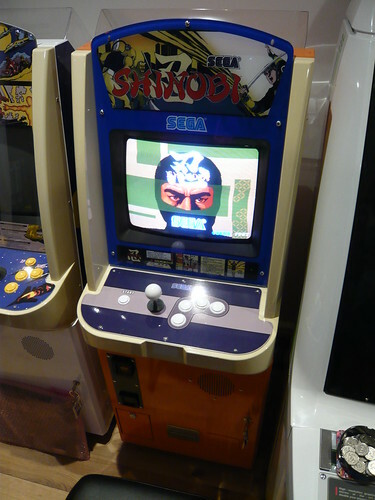 I later picked up a Midi which has always been a Pac-land cab, complete with Pac-Land marquee and cool art on the monitor glass. I would have liked to keep both, but unfortunately didn’t have the space. 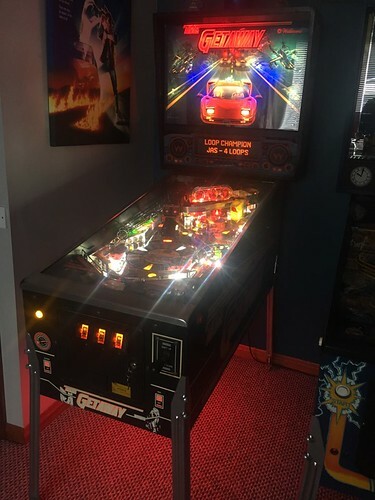 I gave it a good clean inside and out, fitted a new marquee bulb and starter, added a repro ‘Unigame’ marquee, replaced two buttons and then sold it on. A fantastic Japanese metal bodied cab. The monitor on this was awesome. Unfortunately I couldn’t keep both this and the SNK Super Neo 29 Type II, so this one went. I bought this as a project. 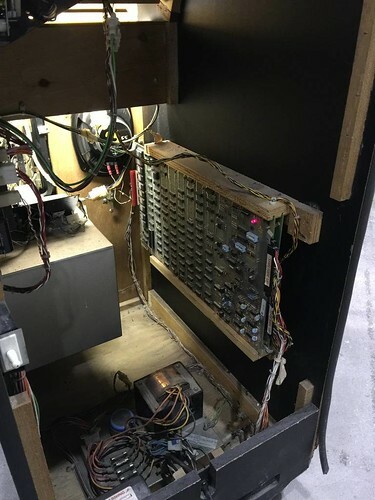 Cosmetically the cab was very good, but it had a monitor fault, PCB fault, messy wiring where the power supply had been replaced, and the steering wheel turned endlessly. 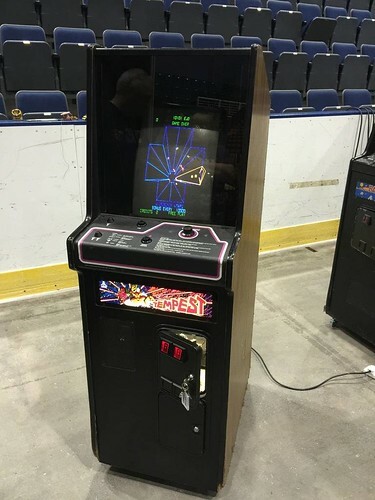 I sold this machine when one in better condition came up for sale, and I’m happy to report that it’s been fully restored. I love the look of vector games, especially in a darkened room, and I thought it would add something a bit different to my collection. Also the small size of the cab was quite appealing. 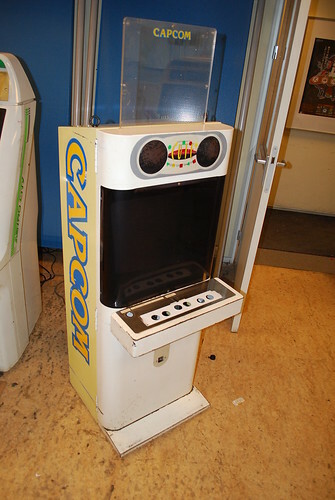 The cab had featured at various PLAY Expo and NERG events. 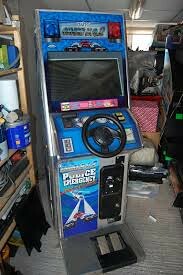 In fact I remember playing this very cab in Blackpool. 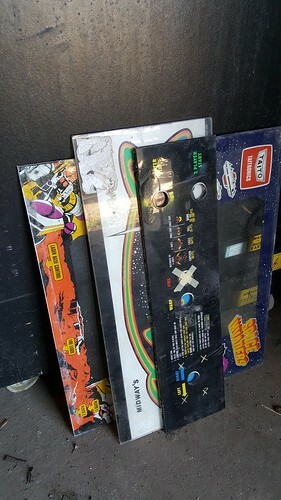 Unfortunately when it arrived the monitor had developed a fault and the game played blind. 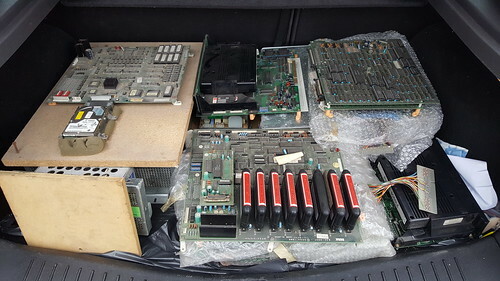 These things happen with old electronics. I never managed to fix it, and due to a lack of nostalgia for the game I decided to sell it on. 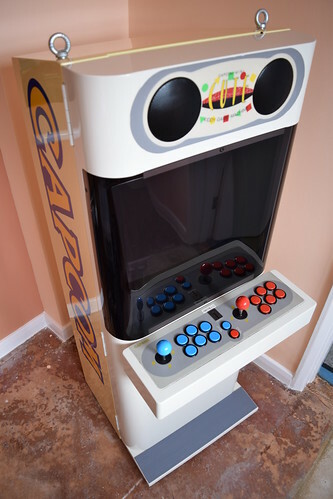 This awesome little Dino King cab conversion had been completely rewired with a new Jamma loom and switcher, and featured a new 1L4B control panel and custom artwork. 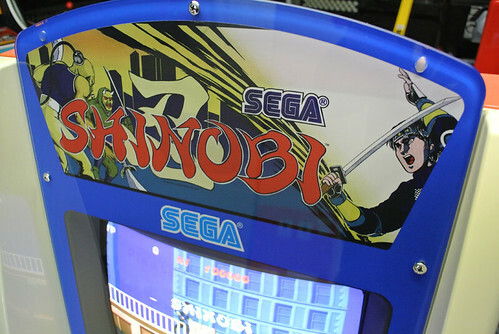 Shinobi is one of my all time favourites, but I could play it on my other Jamma cabs, and I eventually sold this on to make room for another dedicated cab. Well we’ve all been there. Martin the Delivery Man turns up with a cab which you ‘forgot’ to tell the wife about, and then you realise it’s actually too wide to pass through the house door. 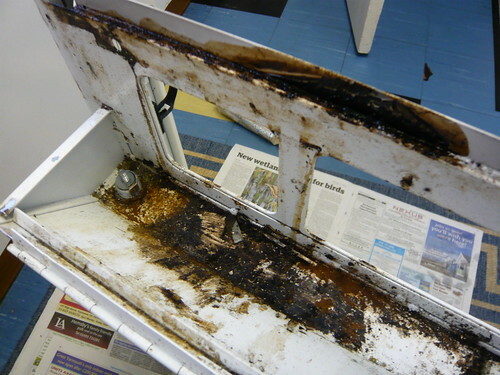 Fortunately the weather was fine, and after removing the shroud, speaker and control panel we were able to get it indoors. 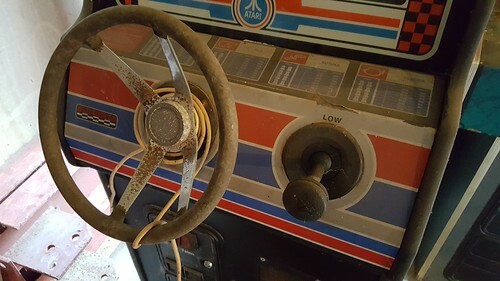 The cab was in great condition, and the game played well, except for a sound fault. 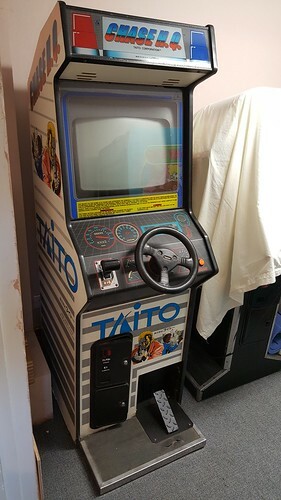 Interestingly the cab was made by Atari Ireland. I managed to pick up some NOS parts and stickers for the cab, but unfortunately had to pass it on before I could work on it due to space issues. 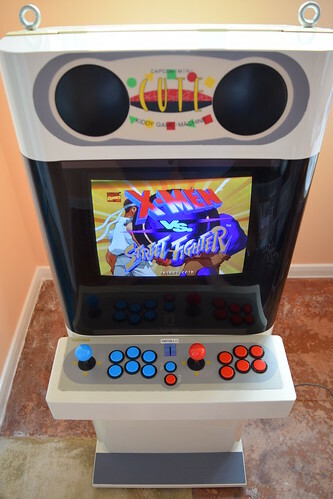 My very first arcade restoration project! I gave the cab a deep clean, resprayed the yellowed speaker surround, fitted a NOS 1L6B panel and replaced the monitor with a nice zero burn MS9 tube. It’s a really nice cab, and I was sad to see it go. 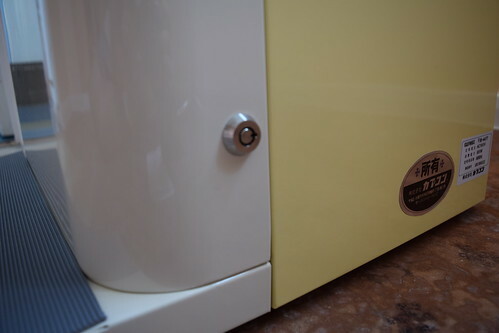 On reflection, the only part I wasn’t completely happy with was the coin door frame respray as the appliance gloss white wasn’t a very good match with the coin door. Another eighties classic which needs no introduction! An awesome machine, sadly I had to sell this on to free up some space. 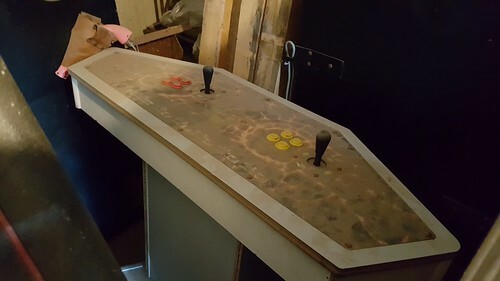 It was sold to Arcade Club, and I’m looking forward to playing it in its new home. 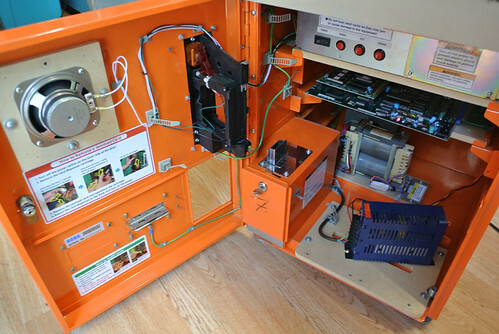 A video of the cab up and running. 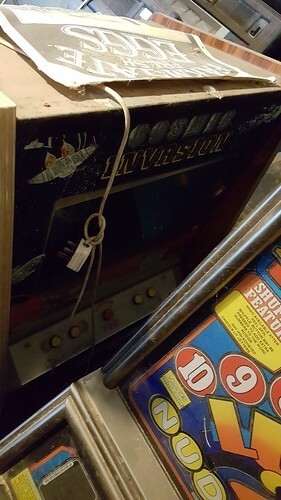 My initial plan was to keep the machine, and I sent it off to Pinball Heaven to be fully refurbished. 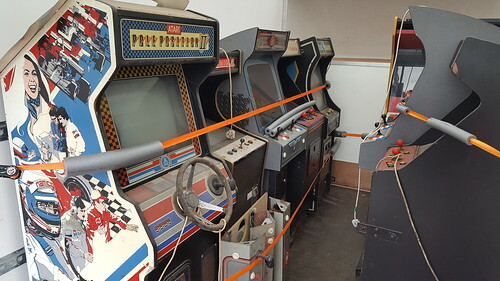 I gave it a lot of thought, but couldn’t see a way I could get it in my games room without selling three cabs. My new plan was to get it back, play it for a while, and then sell it on. The work was completed and Martin was all set to deliver it. 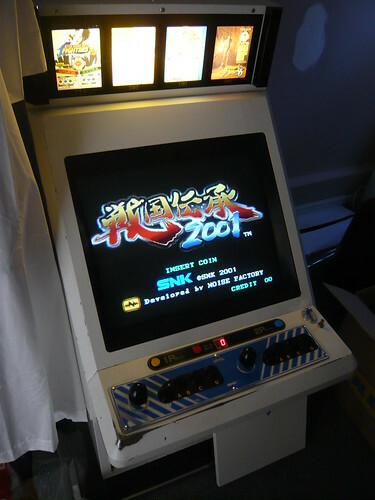 However the evening before delivery I just so happened to see a wanted post on an arcade forum for this very machine. I contacted him, a deal was made and delivery was redirected. 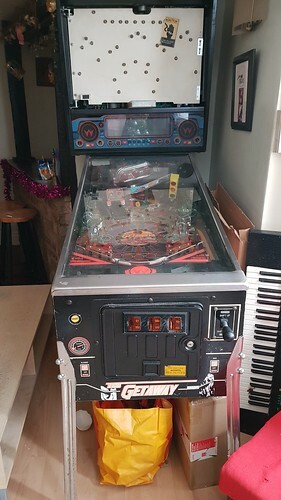 I’m a bit sad that I never got to play it after all the hard work of getting it out of the building, but I needed some cash after some big Raids recently, and I’m pleased it went to someone who really wanted it. 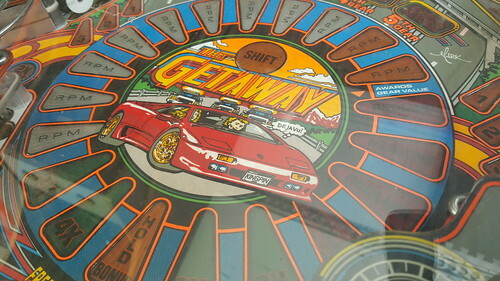 Also I was pleased to see The Getaway at the recent Play Expo in Blackpool and enjoyed a couple of credits. 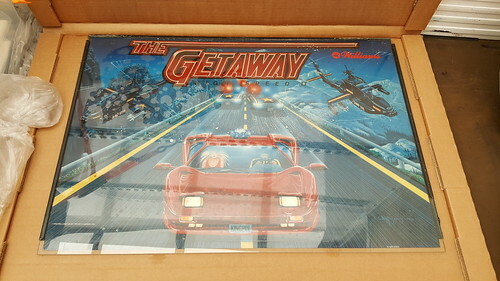 The Getaway looks stunning in its new home! 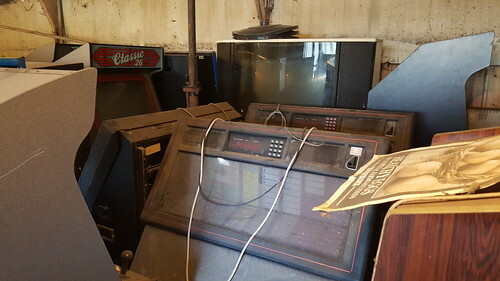 In the second location there was a cluster of cabs, fruit machines and eighties jukeboxes. 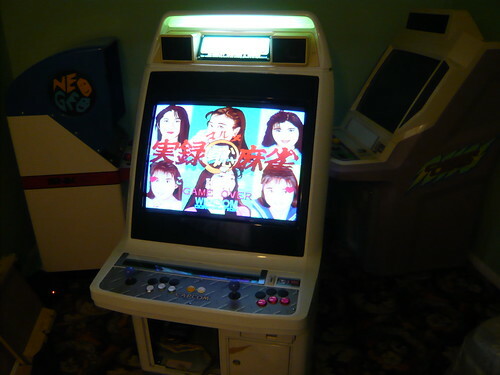 At the back was a beast of a cab, a Deluxe Showcase 33” Primal Rage cab. 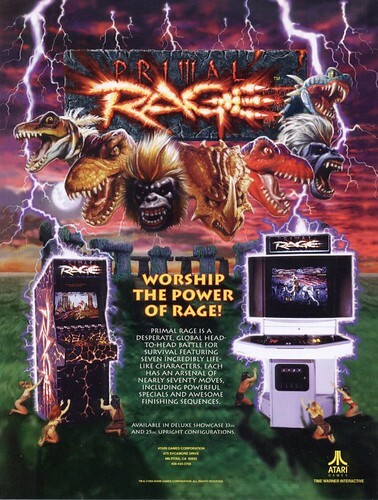 The Primal Rage control panel. Apparently the cab was working when it came off site. However due to its sheer size I had to leave this one behind. This flyer shows how the cab should look. 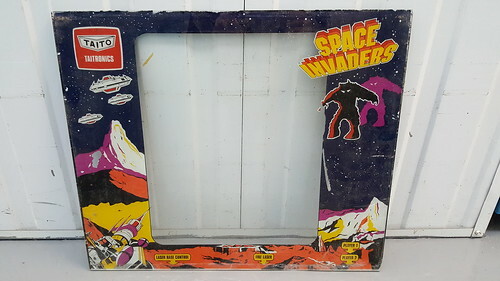 The Cosmic Invasion looked interesting, but unfortunately wasn’t for sale. 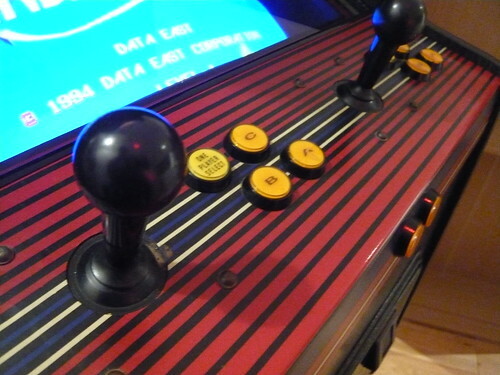 These Pole Position II cabs are like buses! I picked one up on my last Raid, but it was missing the original monitor. Cosmetically it doesn’t look quite as nice as the other one, but it’s still pretty tidy and it's complete. 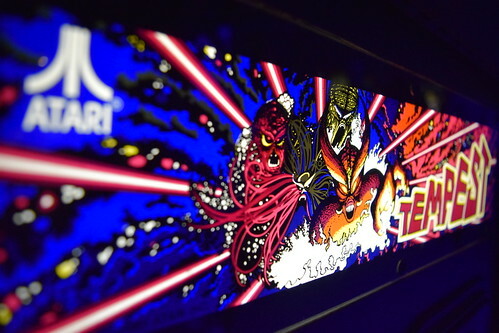 Here is a better look at the Taito Space Invaders bezel. The bezel has proved to be a bit of a mystery, with some intriguing differences between this and the regular Taito Space Invaders bezel. 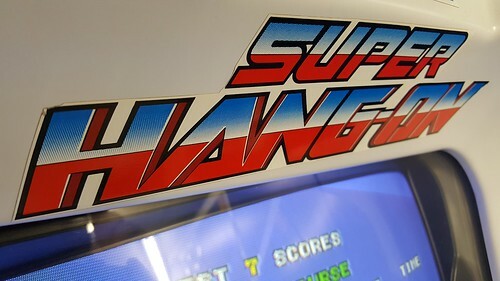 The ‘Space Invaders’ typography, and the art is very different. The clear section of the bezel is portrait instead of landscape. This suggests it was used directly over a screen, like some of the Part II’s rather than in front of a reflected image. 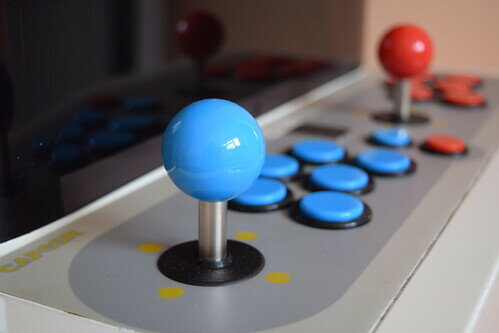 Also Taito Space Invaders, including Deluxe and Part II always had the player one and two buttons positioned horizontally. 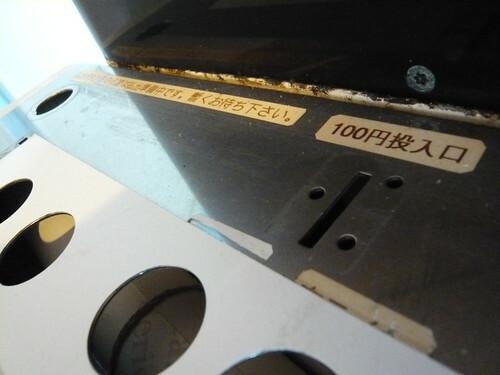 The bezel here indicates that they were positioned vertically. 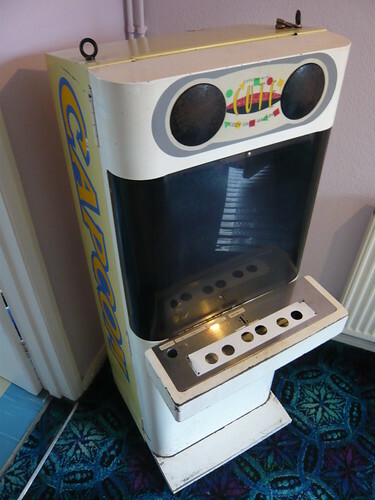 One possibility is that it was fitted to later, smaller midi sized upright Taito UK cabinets. 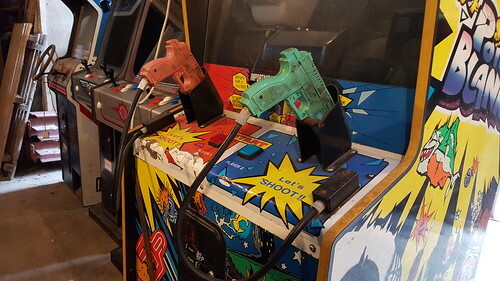 Another possibility is that it was created for a bootleg machine. 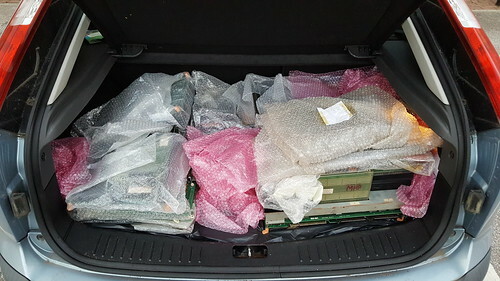 The boot loaded up with PCB’s. The cabs gathered together, ready for loading on the van. Whilst loading the cabs, we had another visit from the dog. The dog was extremely curious about what was going on, but fortunately my wife was there this time to distract him (or her).